"I have worked with children for over 20 yrs and I have never seen anything like it. The children communicated and shared their feelings, worked together and put their friend before themselves. For my son to relate to a giant horse, discover his gentleness and overcome fear, stress and intimidation within one hour was astounding! My son loved Karin and her clinics and got so much out of it. The clinic he attended related to children having two homes. Karin is one of a kind, truly remarkable." Animals and humans share a special bond that supports comfort, healing and learning. Children with sensory, emotional, social and cognitive challenges as well as other areas in need of growth. They are the most commonly used animal because of their ability to respond immediately and give feedback to action or behavior. Horses are also able to mirror emotions. Because they behave similarly to humans in their social and responsive behavior, it is easy for the child/adult to establish a connection with the horse. Board Certified Integrative Family Health Counselor Karin Yapalater & renowned Pediatrician Dr. Greg Yapalater are Master Horse & Child Whisperers and experts in the field of Equine Assisted Learning (EAL) and Animal-Assisted Family Therapy (AAT). Together with Socs, our horse trained in natural horsemanship, and the gentle animals on the farm we offer this incredible opportunity for healing & growth. PTA© prepares your child for any life experience. • Family relationship dynamics: end power struggles! 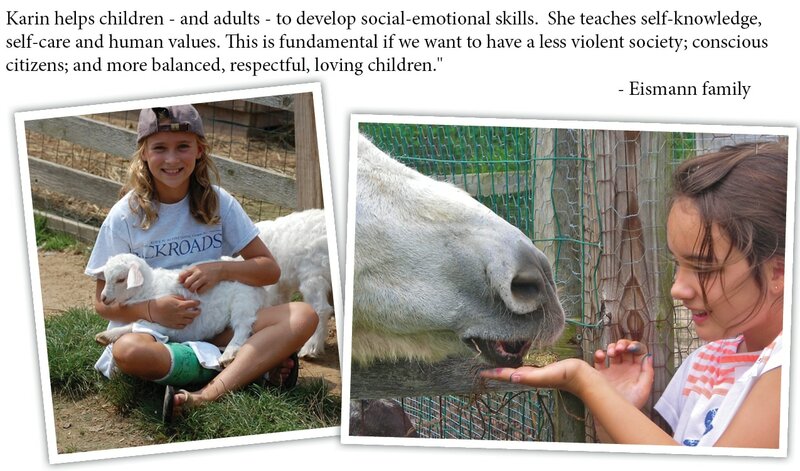 We bring out your child’s highest potential by teaching problem-solving, life skills and natural ways of creating kinship with self, others, horses, and farm animals. All animals are chosen for their gentle personalities & temperaments. Your child's safety and well-being are our top priority. No prior equine experience required.